Japan and Tokyo Guide - Cars and Motorcycles Pt 1. There are so many things to do in Tokyo and having been to most in the past I decided to take a slow day just wondering aimlessly to see what I might discover. It was the first really wet day I've had in Tokyo. It's trees hadn't changed to their autumn colours yet so the green contrasted nicely with the dark bark. They set the mood nicely against the grey sky and buildings. Just looovely! It was also one of those days just just lent its self to exploring the surrounds and observing the goings on around you. I wasn't planning any long trips today just wondering around the popular spots in Tokyo seeing what the locals do on a daily basis! Ok, so I did a bit of car spotting. The roads in Tokyo are certainly busy but what you'll discover that it's not all that bad compared to much smaller cities, including Sydney. Sure its bumper to bumper in the smaller streets but considering there's so many people around you'd expect much more chaos. As for cars, Tokyo is a Toyota city. By observation alone I would say 8 out of 10 cars is a Toyota of some sort. The most popular type is surprisingly van. Yep, the most popular cars in Tokyo are vans. Mind you not just ordinary vans, these are more people mover in style than your run of the mill commercial van. The most popular are the bigger ones called Voxy and Noah. Also surprisingly not many Tarago or Estima can be seen. Just how popular these are can bee seen when you go to Tokyo Disney Land. The car park is full them. 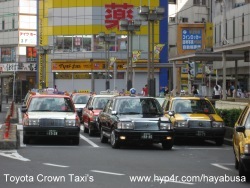 Taxi's in Tokyo are 99% of the Crown variety. The specifications varies tremendously with old names, just when you thought Super Saloon was odd I couldn't even tell you what variants they where. I have no idea why they are so popular. The taxi's are also super clean and shiny none of them I saw have even a hint of panel damage. Anyway while Toyota's rule the Tokyo's city street by day, at night is when you get to see the others if you know where to go. The brand mix starts to change once out of Tokyo city itself. Instead of the larger models you starting seeing the smaller models. The smaller Suzuki's, Nissan's and Honda's appear to be the most common. The Nissan Cube, Honda That's (not a spelling error) where the more interesting models. The other brands like Mazda, Subaru were not as common. Foreign brands are not popular. Mercedes seemed to be the most common. Of note I even saw a VW Golf, Lotus and a Ferrari. Surprisingly the cars in Japan are almost all petrol, and confirmed when I did more research. www.businessweek.com I did not see any diesel variants running. Come to think of it I think even the buses run on petrol. As you've read the Japanese like things kept clean and tidy, and its reflected in everything they do. They cars are another reflection of this cultural trait - clean, many have those white seat covers to prove it! Everything has a place and no matter where you go in Japan there is no rubbish lying around and if there is you can bet that that it would be cleaned up in no time at all. New car prices are quite consistent in Japan. Take the global the Lexus RX. However you'll find second hand pricing even more tempting because not many people want them due to the maintenance costs. 2nd cars are exported all over the world as you probably realise eg. Skyline GTR very popular. BUT will find old cars still being used in Japan. That's all I will say for now - but I will update the page later one when I finish this series. Next part is all about motorcycles!